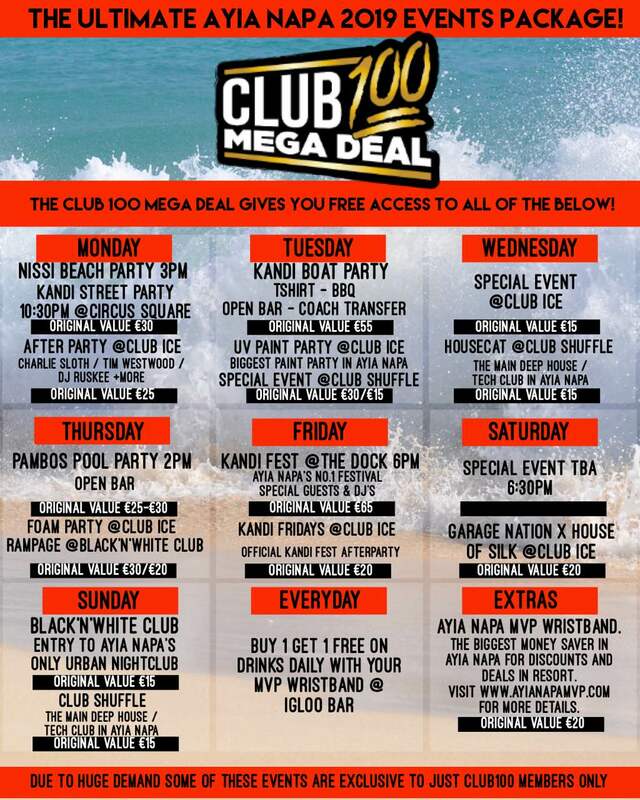 Club100 MegaDeal is All week, all inclusive pass for all the top events, clubs & parties in Ayia Napa. All for the amazing price of £125. Night time – Free entry to the Iconic club Black & White and Foam Party @ Club Ice! ON TOP OF IT ALL YOU GET A VIP QUEUE JUMP AND PRIORITY ACCESS TO ALL VENUES ALL FOR ONE AMAZING PRICE OF £125. You will receieve an e-ticket after placing your order. Print this ticket and bring it with you to Ayia Napa. The collection point this summer will be at the Igloo Bar (next to Club ICE on the main Ayia Napa strip) from 9:30pm until 1:30am. Take your printed ticket there and you will exchange it to the Club100MegaDeal cards. This card will be your tickets to every events, clubs, bars and establishment advertised. You will also be receiving your Ayia Napa MVP wristband right there as well to save you a fortune on discounts and freebies in over 45 establishments all over the resort. It also comes with a guide book and a Map with full details of where to go and how to get there. Also we will have a rep on stand to explain to you everything you need to know about Ayia Napa and give you the full Club100 intinerary with time, place and meeting points for all events.